The eLesson Markup Language (eLML) is an open source XML framework for creating structured eLessons using XML. For easier lesson authoring eLML will offer a web-based WYSIWYG editor in March 2008. Benefit: With eLML you have a clean separation between content and layout. This is more sustainable and easier to maintain over long terms than e.g. HTML or Flash. An eLML lesson can be transformed into many formats like XHTML, SCORM, IMS Content Package, PDF, LaTeX or ODF (Open Document Format). With one content source file you can create many output format. See the website for examples. Users & References: Many SVC-projects like GITTA, PTO, eFeed, Cartouche, GLOPP, FOIS and other Swiss or international projects. Teaching Scenario: eLML is based on a pedagogical concept called ECLASS. See website for more information. 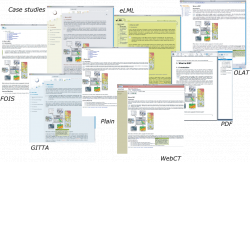 Teaching Scenario (extended description): An eLML lesson is XMLSchema based. But since the schema is very open you can use eLML for all kinds of teaching scenarios.